How Many Times Can You Claim Exempt? How Many Exemptions Should I Claim on My W-4? The federal government collects personal income tax from all workers so it can supply necessary services. This tax is generally paid through deductions from each paycheck; these deductions are called withholding. The amount of withholding depends on the salary as well as the number of exemptions claimed by the employee. You can claim as may exemptions as you are eligible for on your W-4. Keep in mind, however, that this will likely result in a large tax bill once you have submitted your return. When you get a job, you must complete a W-4 before your employer pays your wages. 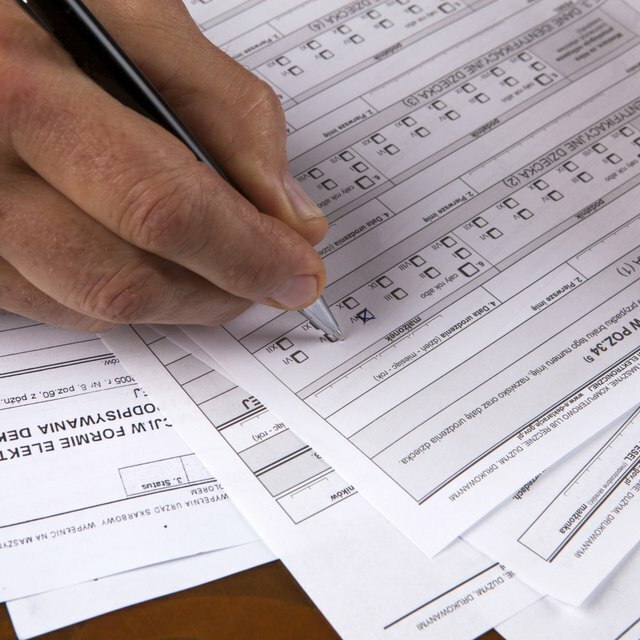 This form controls the amount of withholding for each paycheck by allowing you to specify the number of exemptions. Each exemption means less tax is withheld. If you fail to fill out this form, your employer takes out taxes as though you were single without any additional exemptions. The total amount withheld throughout the fiscal year acts as a credit against the total personal income tax that you owe come April 15. If the amount withheld exceeds the tax required, you receive a refund. If it is under the tax, you must pay the difference plus any potential penalties. You can claim an exemption for yourself if no one claims you as a dependent. You can add an additional exemption if you are single and have just one job, are married with a spouse who does not work, or if you and your spouse make $1,500 or less. Thus, in most cases, you can claim a minimum of two exemptions. You can also add additional exemptions for a non-working spouse, and for any dependents other than your spouse or yourself. This is the maximum number you can claim to ensure that the tax withheld from your paycheck will match or increase the tax you owe for the year. For example, if you are a father of two minor children and have a non-working wife, you can claim a maximum of five exemptions: one for one for yourself, one for being married to a non-working spouse, one for your spouse and two for your children. You can increase the maximum number of exemptions if you meet certain conditions. If you are single and pay more than 50 percent of the upkeep of your home and dependents, you can add an exemption for “Head of Household.” If you plan on spending at least $1,900 for child or dependent care, add another exemption. Finally, if you plan on taking advantage of the Child Tax Credit, you can enter either one or two exemptions for each eligible child. Instructions for this credit are explained in IRS Publication 972, Child Tax Credit. You may find that you receive a large tax refund every year, on the order of thousands of dollars. This may be because you have a high rate of itemized deductions or are working more than one job. If this is the case, then you can increase your exemptions even further. This lets you keep more of the previously withheld dollars, instead of allowing the government to use it, interest-free. A worksheet on the W-4 enables you to calculate how many more exemptions you can claim based on itemized deductions and multiple jobs. You want to specify enough exemptions that the tax withheld equals or is slightly greater than the tax you’ll owe on April 15.